So, when can we expect Kate Middleton's 3rd royal delivery? Kensington Palace announced the glorious news of Kate Middleton’s pregnancy this morning and suffice it to say, we have so many questions…Like how much longer do we have to wait until baby number three arrives? 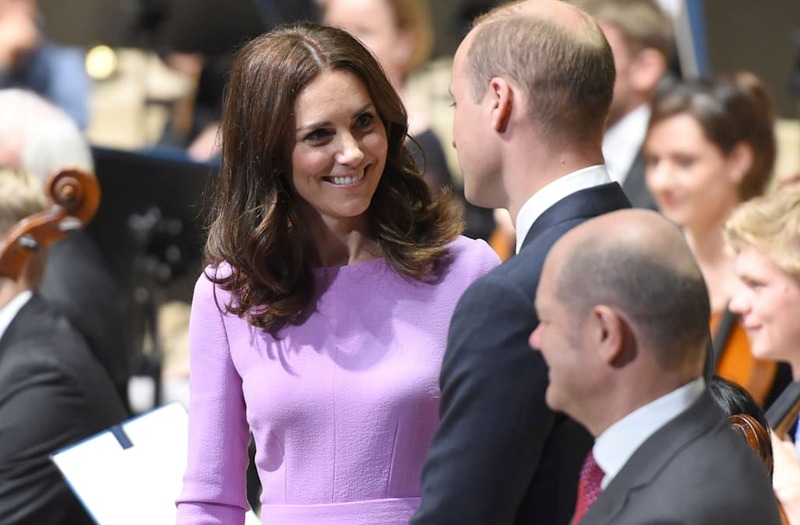 As with her previous two pregnancies with Prince George (4) and Princess Charlotte (2), Middleton is suffering from Hyperemesis Gravidarum (severe morning sickness). In the past, K-Middy's pregnancies were revealed earlier than the 12-week mark because of her debilitating condition and this time is no different. The Duchess wore her black pumps and carried a sparkly black clutch to complete her look. The dress is a bit edgier than she typically chooses, but we loved it. Just the tiniest hint of a bump! Kate is now 14 weeks pregnant. The royal mom-to-be (round 2!) was glowing as she left the venue. Kate attends the Action on Addiction Autum Gala in London on October 23, 2014, wearing a black Temperley London dress. Kate, wearing a pale blue bespoke gown by Jenny Packham, arrives at the Natural History Museum on October 21, 2014. The Duchess is the royal Patron of the Museum. Kate dazzled on her first day back to royal duties since announcing her pregnancy. The Duchess looked stunning in her floor length Jenny Packham gown. She wore her hair down in bouncy curls with a delicate sparkly necklace. Kate leaves the Natural History Museum. The Duchess heads outside to present the awards of the evening. Kate presents the Young Wildlife Photographer of the Year award to Carlos Perez Naval at the Natural History Museum. Kate presents the Wildlife Photographer of the Year award to Michael Nichols at the Natural History Museum. Prince William and Duchess Kate are seen as they welcome the President of Singapore Tony Tan Keng Yam at the Royal Garden Hotel on the morning of October 21, 2014. Kate is wearing a coat by Alexander McQueen and Jane Taylor hat. Kate's hair is pulled back in a low ponytail under her Jane Taylor hat. You can see the detail of the checked pattern of her Alexander McQueen coat. The Duchess of Cambridge and Mary Tan depart the Royal Garden Hotel. Kate smiles during the Horse Guards parade. The duo prepare to meet the President of Singapore. William and Kate laugh together during the Horse Guards Parade. With this timeline in mind, we can use Charlotte and George’s respective birth announcement timelines as a reference to infer when the third mini-majesty may arrive. News of Princess Charlotte’s birth was released on September 8, 2014, and mama Middleton gave birth on May 2, 2015. With George, the announcement came on December 3, 2012, and the Duchess gave birth on July 22, 2013. If the Royal Family is using the same time equation for their third child, Middleton’s due date is likely around late April or early May. We're already dreaming of the adorable baby photos. Kate Middleton right before her graduation ceremony in 2005 rocking an oh-so-reliable white tank top (with a little bit of her tummy showing) and bootcut jeans. Howdy! Here's Kate Middleton at a music festival in 2005 looking very outdoorsy in a cowboy hat with some matching suede riding boots. Kate Middleton definitely rocked cropped tops before it was even a trend! Here she is with her mom, Carole, in a simple white crop top that she paired underneath a blue blazer. Here's a full-length photo of her casual -- yet -- stylish look. Kate Middleton braved the frigid temps in 2006 with a cozy outfit of a Russian-style fur hat, a wool coat and a pair of her go-to suede boots. Polka dot beauty! Kate Middleton cheered her future husband Prince William on at a polo match in 2006 in a bright red wrap dress. Flower power! Kate Middleton attended a 2006 party in a floral frock that hit just above her knees. She paired the look with a light pink crushed velvet jacket and some seriously pointy flats. Kate Middleton's off-duty style was impeccable. At another polo match in 2006, she rocked white flared jeans and a tummy-bearing sheer top. A close-up look at Kate's super casual ensemble. Kate Middleton looked fabulous in a black dress with tights and suede knee-high boots while out on the town in 2007. Kate Middleton made denim skirts a thing before they even became trendy. Here she is on a casual shopping trip in 2007. What a party animal! Before becoming a royal, Kate Middleton was just a regular 20-something who went out at the hottest clubs in London. Of course, she always looked great for the occasion. Before Kate Middleton was wearing tiaras and fancy pearls, she was the queen of accessorizing. Between the scarf and the French-inspired beret, she looked absolutely flawless in 2007. Another close up look of Kate's chic accessorizing. Uggs -- oh my! Even Kate Middleton couldn't resist the comfy boots that blew up in popularity in the early 2000s. Here she is in 2007. While Kate rocks multi-million dollar jewels now, she still loved to accessorize even before she became a royal. We're totally loving that chunky white necklace! Kate Middleton and Prince William Are Expecting Baby No. 3!